J&A Logistics Australia Pty Ltd began in the transportation and freight industry in Bendigo in late 2002 with only one employee and now provides jobs to close to 50 people in Bendigo and Victoria. Our staff are encouraged to improve their skills through all types of formal training in their area of employment. Our drivers have Certificate III in Road Transportation Distibution and our office staff have Certificate III in Office Administration or Busines Administration. We have a happy team who recognise the importance of our clients and customer service. Our customer service model is simply: don’t make false promises, be honest and provide the service as promised. 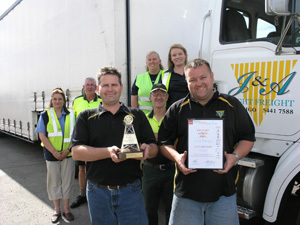 In 2007 J&A Logistics Australia Pty Ltd were nominated by their peeers in local business in Bendigo and won the Bendigo Business Excellence Award. It is our dedication to customer service and fast, effiecient and reliable freight and transportation at competitive rates that makes us the best in local business. Our fleet of approximately 35 vehicles range in size from small vans to full sized semis and B Doubles. This means we can deliver your freight, large or small, efficiently and reliably. While we specialise in overnight freight from Melbourne to Bendigo, our overnight service extends from Melbourne to Mildura and anywhere in between. We can handle the road tranportation of your freight anywhere in Australia.